A Boston running club is helping opiod users beat their addictions, one race at a time. Just a few years ago, Sean Staunton's opiod addiction overwhelmed his life. "It started with percs then moved to heroin. I've lost jobs, I lost friends. You know relationships," Staunton said. But the 32-year-old is now training to run his first Boston Marathon and he credits coach Mike Ferullo, who he met at a halfway house. 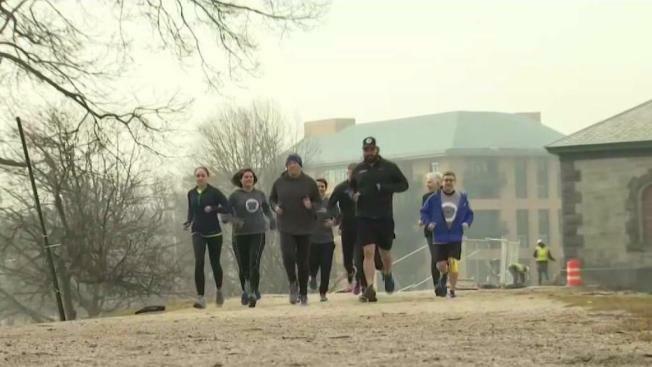 "If people want to get better, they have to put the effort into it," said Ferrullo, who is a licensed therapist, a former drug user, and founder of The Boston Bulldogs, a running club focused on helping its members beat addictions through the sport. The program is free and open to everyone. Some members are in recovery while others aren’t addicted at all and simply focused on the weekly runs and camaraderie. Ferullo says over the years, dozens of opiod users have beat their addictions because of his program. But not everyone makes it through. "Yeah, yeah, the drugs got the best of them," says Ferrullo. But he isn’t giving up hope, because there are still many more success stories like Staunton, who’s have stayed clean for nearly two years. He’s now working a steady full-time job and engaged to his fiancee, Paisly Madan. It's all part of the long road to recovery. "He’s got me running which I never thought would happen," said Madan. The Bulldogs have chapters in Brookline, South Boston, and Plymouth. Along with Staunton, four other members of the club are running in this year's Boston Marathon. The Bulldogs next big event is the Run for Recovery 5K at Franklin Park, Sunday, May 20, from 9-12 p.m.